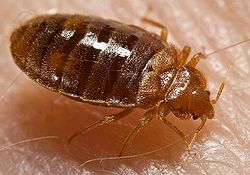 Bed bugs are parasitic insects that prefer to feed on human blood, the name “bed bug” is a derivative of the insects’ preference of living in houses, especially beds or other areas where people sleep. Bed bugs are especially active at night, but they are not exclusively nocturnal, capable of feeding on their hosts without being noticed. There are numerous adverse health effects that may occur as a result of bed bug bites such as: skin rashes, allergic symptoms and other effects. An effective diagnosis of the symptoms would involve finding the bed bugs and the occurrence of the symptoms. Bed bugs were discovered thousands of years ago and have been known as human parasites for all that time. They had been eradicated but have seen an increase in prevalence since 1995. Bugs and their eggs are inadvertently brought in from other infested dwellings, usually hotels, by visiting pets or a visiting person's clothing or luggage. Infested items (such as furniture, clothing or backpacks) are brought in the home. Bed bugs may travel through duct work of false ceilings from nearby infested homes and dwellings or other infested items. Wild animals, such as bats or birds, may also harbor bed bugs or other bed bug related species. People or pets that visit an infested area (apartment, subway, movie theater, or hotel) may carry the bugs to another area on their clothing, luggage, or body. Top Quality Exterminating & Pest Control, servicing Long Island and Queens, New York has the knowledge and experience to detect and eliminate bed bugs around the home using effective and environmentally safe pesticides. Contact Us by email or call us toll-free at 1-888-853-3984 now for your free no obligation quote. Bed bugs can be found singly, but they often congregate once established in a dwelling and will usually remain close to their hosts in or near beds or couches. They will live or congregate in a variety of areas, however, including luggage, vehicles, furniture and bedside clutter and may also nest near animals that have nested within a dwelling, such as bats, birds or rodents. The eggs of bed bugs are found in similar places where the bed bugs themselves are found, and are attached to surfaces by a sticky substance. Bed bugs can be detected by their characteristic smell of over-ripe raspberries and bed bug detection dogs are trained to pinpoint infestations, with a possible accuracy rate of 97.5%, based upon tests conducted under controlled conditions by researchers. Bed bug extermination will usually require a combination of pesticide and non-pesticide approaches. Pesticides that have historically been found to be effective include: pyrethroids, dichlorvos and malathion although resistance to these forms of pesticides has increased significantly over time and there are concerns of adverse health effects from their use. Mechanical approaches such as vacuuming up the insects and heat treating or wrapping mattresses have been recommended. Control of bed bugs requires both persistence and experience and while a pest infestation can sometimes be controlled using over-the-counter products or home remedies, to effectively exterminate them, it is best to contact your local pest control service such as Top Quality Exterminating and Pest Control serving Long Island and Queens, NY. Due to a bed bugs’ small size and nocturnal activity it is difficult to find them on your own and only a trained pest control professional can help you get rid of bed bugs after performing an extremely detailed inspection. Top Quality Exterminating and Pest Control service technicians follow a strict set of guidelines to ensure your health and safety. We use only registered Environmental Protection Agency (EPA) pesticide products and our technicians are registered and licensed with NY State and participate in a continuing education program.